Luca Terracini is an Iraqi-American journalist living recklessly 'outside the wire' in Baghdad. When he uncovers a billion-dollar bank heist, he's determined to find the money, spurred on by a suicide bombing that killed his true love. As Luca investigates, other lives become entwined with his, and THE WRECKAGE becomes a tale of four people: Luca, willing to risk everything since he's lost everything; UN accountant Daniela Garner, who knows plenty about the heist; a petty thief who stole a notebook from a high-flying banker who might be able to explain where the stolen money has gone, but has since vanished himself; and London ex-copper Vincent Ruiz, who gets scammed. Luca knows there are plenty of dark and shady corners in this war, but as he seeks to uncover the truth of the missing billions, the manhunt for the missing banker leads to Luca being evicted from Iraq and separated from Daniela, putting his investigation in dire jeopardy. As well as his life. In Robotham's seventh and perhaps most ambitious novel, the Australian author eschews his usual style of claustrophobic psychological thrillers to pen a broader story of global intrigue that intersects the war in Iraq and the global financial crisis. And what a fine job he does. For me, this was the best thriller of 2011, an impressive tale that pierces the murk surrounding the billions of dollars being poured into Middle East military operations, and the fear, confusion, and danger around every corner for those there on the ground. THE WRECKAGE crackles with pithy description, insights and observations in throughout its compelling storyline. Various threads entwine secretive powerbrokers in big business and government. Combining the scope of a Tom Clancy novel with a finer balance between character, suspense, and technical detail. This is tense storytelling of the highest order, with an authentic ‘feel’ that grips emotionally as well as intellectually. 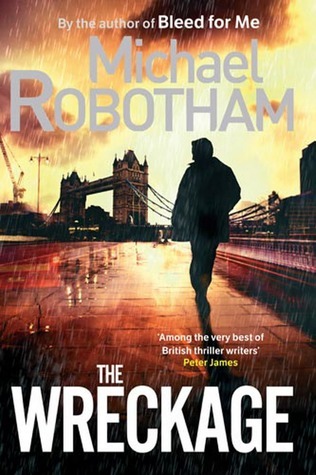 Michael Robotham has added his name to those near the very top of the crime-writing tree. In 2011 I wrote a mini-review of THE WRECKAGE as it had been chosen for the New Zealand Listener's prestigious 100 Best Books List. Today's extended look at this very fine book is an expansion of those thoughts and other reviews I wrote following its publication in 2011.